Kew Palace0844 482 7777work Historic HouseKew Palace is the smallest and most intimate of the royal palaces. The four-storey brick house was built c. 1631 by Samuel Fortrey, a merchant of Dutch origin, whose initials together with those of his wife Catherine, can be seen above the entrance. It is constructed of red bricks laid in a style known as Flemish bond, consisting of bricks arranged with sides and ends alternating. The gabled main front gives the house a Dutch appearance. Later alterations included the installation of sash windows to replace the original brick mullions and transforms. First used by the Royal Family in 1728, the Palace was finally purchased by George III in 1781 as an annex to the White House (located where the sundial now stands) to accommodate his expanding family, subsequently becaming a more permanent home for the Royal Family. Queen Charlotte died here in 1818. Having lain untouched since Queen Charlotte's death, the Royal Kitchens at Kew can now be explored for the very first time. Your visit will open the door to a lost space and let you discover more about life in the historic times, the servants who worked in the kitchens and Georgian culinary life. Entrance to the Royal Kitchens at Kew is included in the Kew Palace admission ticket and is FREE for HRP members. Kew Palace is the smallest and most intimate of the royal palaces. The four-storey brick house was built c. 1631 by Samuel Fortrey, a merchant of Dutch origin, whose initials together with those of his wife Catherine, can be seen above the entrance. It is constructed of red bricks laid in a style known as Flemish bond, consisting of bricks arranged with sides and ends alternating. The gabled main front gives the house a Dutch appearance. Later alterations included the installation of sash windows to replace the original brick mullions and transforms. Suitablity for the Disabled: WCs. Kew Palace will reopen on 2 April 2015. The 2015 season will run until 27 September. 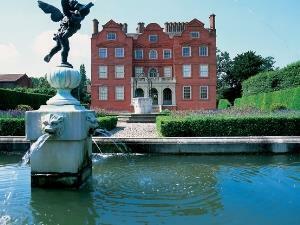 Now when you visit Kew Gardens you can visit Kew Palace at no extra charge. On busy days, entry to Kew Palace will be on a first-come, first-served basis. Public transport is very convenient and there is limited parking. Victoria Gate, the principal gate, is on Kew Road (A307) and is a 7 minute walk from Kew Gardens Station. Car: Coming from the south or west on the A316 or M3 motorway (which becomes the A316) turn left at the Richmond roundabout onto Kew Road (A307). You will see the Pagoda to your left - park in a permitted place, alongside the Gardens, on Kew Road.